AYEM™ helps you keep your weekday morning protein and omega 3 DHA intake on track. However, we know we all like to let loose with routine on the weekends, so unless you love AYEM™ so much you can’t bear to go without it, below are some ideas to give yourself a treat, while minding the protein gap and your omega 3 DHA intake. Some people keep this one for special occasions, but it’s a seriously tasty, healthy brunch choice. Boil your kettle. Place a deep frying pan on the hob and pour boiled water into the pan up to about 1 inch. Adjust the heat until you get tiny bubbles across the base of the pan – poached eggs like a slight simmer, not a boiling bath. Break the eggs into the pan one by one and let them simmer for one minute (use a timer – this is an exact art). Then, remove the pan from the heat and let the eggs sit in the water for ten minutes more to let them gently set. 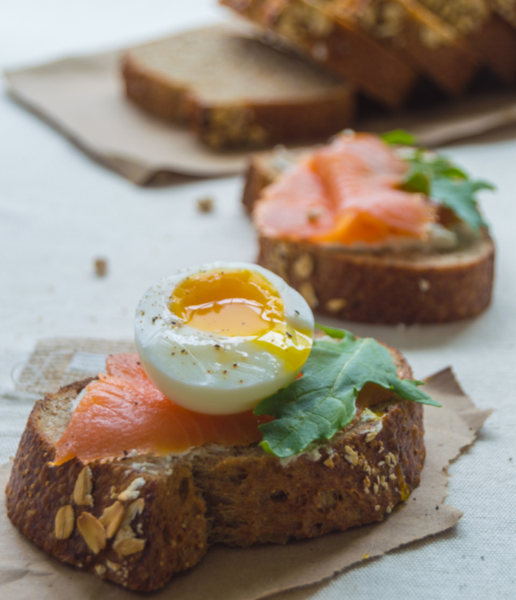 While the eggs set, toast and butter your rye bread then artfully arrange the salmon on top. When the eggs are ready, carefully remove them from the pan with a slotted spoon, place onto kitchen roll briefly to soak up any excess water and then place on top of the salmon. Season the eggs and sprinkle the herbs over. Serve immediately and enjoy. This is one of those meals that nourishes, surprises and never gets old (despite its Victorian origins). Melt the butter in a deep frying pan with a lid. Add the onion and a pinch of salt. Fry until softened (5-6 minutes). Stir in the curry powder and cook for 1-2 minutes. Breathe in that beautiful spicy aroma. Add the uncooked rice and stir through. Season, add the stock and bring to a simmer. Reduce the heat to the lowest setting and cover with lid. Cook for about 12 minutes, until the rice is tender. While the rice cooks, boil the eggs for around 8 minutes then run under cold water. Peel and slice into quarters lengthways (it looks more chefy lengthways). Bring water to the boil in a shallow pan, add the kippers and cook for 4 minutes. Fish the fish out to cool it down then break the flesh into large flakes, discarding bones and skin. Once the rice is cooked, stir in the peas and flaked kippers. Cook gently for 3-4 minutes. Taste and season until it’s just right for you. 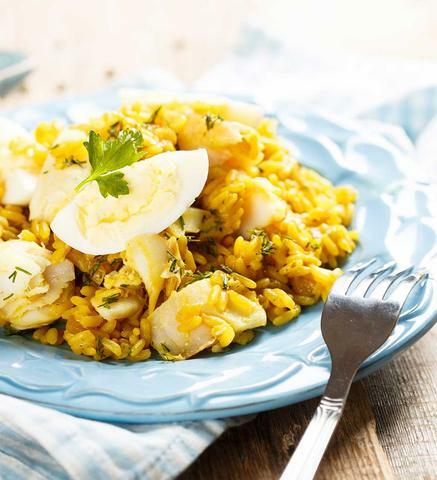 Spoon the kedgeree onto a plate, place the eggs in a cute pattern on top and sprinkle the fresh herbs over. Eat hot. Be happy.